i gave the america’s test kitchen brownies a go, since my sister liz asked for all the recipes they had on the matter (she’s on a brownie kick, i think). weirdly enough, the brownies are at the end of the cookie section, so we’ll say this is a part of the original cookie test. the recipe had no weird things, i’m happy to say. it did call for two kinds of chocolate, but i was ok with that. the only adjustment i made was it called for 1-1/4 cups of sugar, but i stopped at 1 cup because i used semi-sweet chocolate instead of bittersweet (the recipe called for either). 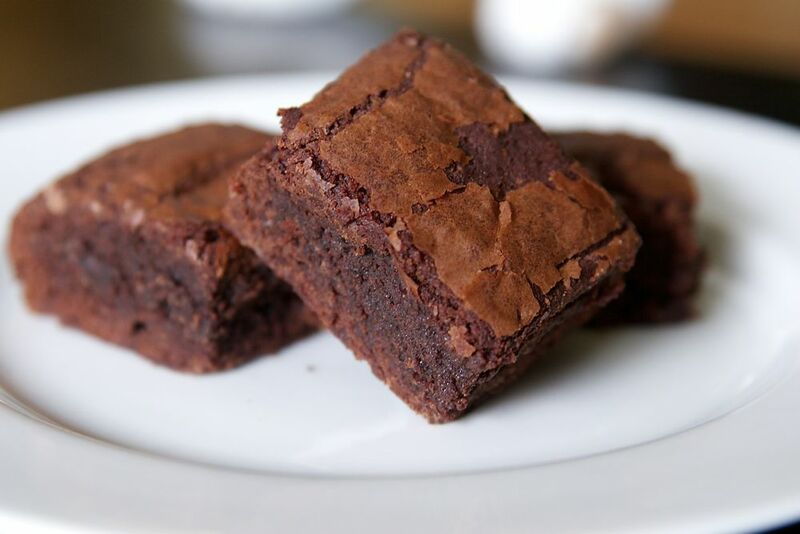 ATK has three kinds of brownies (ok, 4, but the fourth is a low-fat version, and who wants that?? ): classic, chewy, and fudgy. i made the fudgy. they turned out dense and delicious, but i’m going to try the chewy version next in hopes that it will be even better. ok, ATK did call for one weird thing. you made the brownies in an 8″ square pan, but you got SIXTY-FOUR brownies out of it???? come on, ATK. no way on earth people are cutting up 1″ brownies. i had a difficult time getting 16 brownies out of the pan. point: up in the air. it was good, but i think the recipe i had previously was a little better. however, mine are more chewy. i’ve got to compare apples to apples i think.